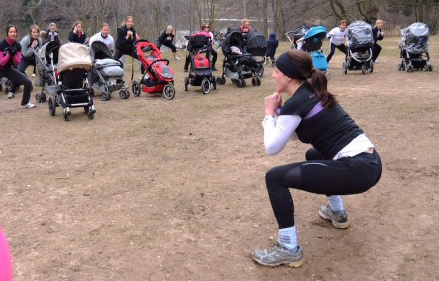 They call it Buggyfit, but in my head right now it’s Buggy Boot Camp. Borrowed from http://www.buggyfit.co.uk as I don't want you seeing me all sweaty! I wasn’t surprised when four kids on bikes stopped and openly gaped at the fifteen mums doing press-ups by their buggies on the grass. To the non-parental eye we must be quite a sight. I took exception to their laughter, however, when we jogged over to the steepest steps in the world and started running up and down. One day they too will have excess flab round the belly button. At least we’re doing something about it. It’s also very varied, there’s no time to dread the crunches before she parks up and tells you to spread ’em (the mats on the grass that is). Her wee boy (who’s nearly three) even cheers us on, shouting ‘YAY!’ just when you’re about to collapse out of ‘the plank’. So although I sometimes feel like I’m going to throw up and I often feel like a bit of an idiot at the back of the pack, I’ve realised that the endorphin rush afterwards sees me through the day. So I would recommend it.